Blondie and Brownie: It's Time for Pancake and Hot Chocolate Month! It's Time for Pancake and Hot Chocolate Month! Will winter ever be over? Fortunately there are a couple things to look forward to in February besides Valentine's Day (and yes, your birthday, mom). Today kicks off Clinton Street Baking Company's annual Pancake Month Celebration and City Bakery's Annual Hot Chocolate Festival. 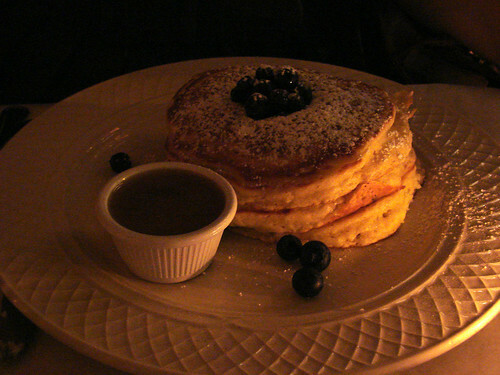 The special pancakes are served Monday through Friday from 8am until 4pm and 6pm to 11pm. And if you're not a fan of the particular pancake of the day, they do have their famous wild Maine blueberry or banana walnut, with warm maple butter pancakes on their everyday menu. As for Hot Chocolate...last year Blondie was a fan of the Happy Hot Chocolate made with vanilla bean and milk chocolate. Blondie called it "Very creamy, very smooth, and most importantly not overwhelming sweet." This year Happy Hot Chocolate is on tap for the 27th. For the full schedule, check out the official Hot Chocolate Festival site. And head over to TONY's the Feed blog where Amy Pitt reviewed each of last year's hot chocolate flavors.to cheer us through the February gloom. Yay! Pancake Month at CSBC! Thanks for posting the lineup. Definitely going to make as many as I can! WHHHHYYY DO I NOT LIVE IN NEW YORK?! (I'm assuming this is in nyc... if not then substitute "new york" for "anywhere in the usa"! 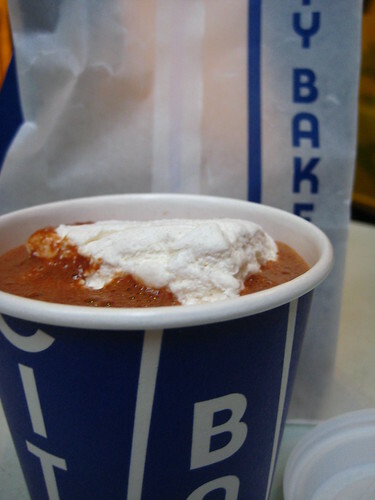 I think it's kind of upsetting that CIty Bakery's Hot Choco Festival is repeating flavors through the month. Shouldn't they make it really original every day? Still I'm pumped to go to City Bakery every dya. Don't Be Tarty to the Party! Want to Eat Some Meatballs For Charity? !